Hello and welcome to another series of blog posts written by students in Memory, Aging & Expressive Arts! This is a special opportunity for students to share their insights, stories and reelections on their semester experience with all of you. For me, it is a chance to build awareness and understanding of the power of art to positively impact people in so many ways. Thanks for reading! This semester in the Memory Aging & Expressive arts class, I learned so many things about memory impairment and connection by working with the members of Coffeehouse. I had a great club member who was extremely open to trying new artistic projects and practices, and at the beginning of the course stated that she wanted to try what I do in school everyday. We dyed fabric, silkscreened some prints, drew and painted. I also wanted to do some of the things that she loves to do, like baking. It was very enjoyable baking with her, and our apple pies turned out amazing. Yet the best aspect about the projects that we did was the way it allowed for conversation to happen, and I think that we both got to know a lot about each other in the short time that we met each week. I think that we both bonded with each other extremely quickly, because we both have experiences with memory loss: I with my experiences with my Grandma with Alzheimer’s and my club member living with the same disease. This similarity really allowed for us to gain an understanding of each other’s perspectives, and the different viewpoints we each had on memory. I came into this class hoping to gain more insight into what my Grandma is going through, and the different ways that we can approach this disease. Gaining this from the course and my Coffeehouse partner was an extremely rewarding and gratifying thing. The Florentine street map painting proved to be a success! 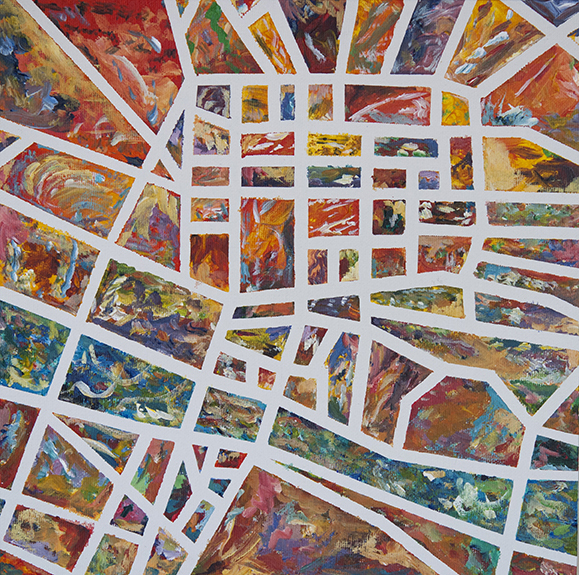 The ideation of this piece was inspired by a conversation my Coffee House club member and I had about our mutual wonderment of Florence, Italy – the art, the city, the people… We began with a taped outline of the street map of the city, painting the little squares of open canvas in brilliant, rich colors and layering the paint on thick to make for a nice contrast with the starkness of the white streets. At first we painted on separate sides, later turning the canvas to work on each other’s, and finally painting the whole area of the canvas simultaneously. After making the final touches to our painting, we peeled off the tape that lined the streets to reveal a truly captivating work of art. Where the tape previously was hiding under the paint was now a stark, bright white of the canvas to contrast with the marbled yellows, reds, and oranges of the land and teals, blues, and purples of the river. After much examination of the painting – relating the tiny shapes of painted marvels to masterpieces framed in a gallery, to bright jewels and treasures, and to different dimensionalities – my Coffee House club member came up with the perfect title for the piece, Kaleidoscope. Not having touched a paintbrush since a freshman year foundations course, my Coffee House club member taught me a thing or two about painting technique and color usage. When we began working on the piece, I was painting bright solids of reds and oranges. By the end of that first class period, I began experimenting with more gestural strokes of the paintbrush like I watched my club member do. When I began using this technique and we were turning the canvas around to work on the squares that the other had done, the whole piece started taking form into the cohesive, collaborative masterpiece it became! Collaborating on a project with my Coffee House club member did away with any stigmas and nervousness I may have had about persons with dementia prior to taking this course. Everything I have learned from our readings, discussions, and presentations, as well as conversing and creating a project with him has reinforced the idea that it is better to focus on what persons with dementia can do, and our role – as outsiders to the disease – in this journey is to help make the transition as graceful and joyful as possible! My time at Coffeehouse Club has taught me that life is an unexpected journey, especially for those with memory loss. There are so many sudden twists and turns that have the ability to derail you from your current path. There is no way to be prepared for it, but there is always a way to reframe your thoughts and take it as a blessing. University of Michigan Geriatrics Coffeehouse Club has the beautiful ability to make time stop. The first time I noticed it was right after I got paired with my Coffeehouse club member and we were working on our first project together. We were halfway through painting an abstract piece when I realized that not once that morning had I thought about all of the assignments I needed to complete that week, my imminent graduation, or my concern for getting a job soon. As a senior preparing to graduate from college, I had so many things running through my mind every day, but for an hour and a half every week, everything slowed down. Soon it was not just Thursday mornings that reminded me to breathe, but every day began to grow like that. While listening to some music from her teenage years, my Coffeehouse partner came to life. She was tapping her hands and humming along with a somber smile. I asked if the music had made her upset because she cannot relive that part of her life. She looked at me and replied, “It is happiness, that I am living with all that past behind me.” My Coffeehouse partner taught me that every moment is precious. If you blink your eyes or look away just for a second, that moment could be gone. My Coffeehouse partner reminded me to quit worrying about the future, to experience the now, and that the future will come no matter what you do. She reminded me to live, and for all of that I thank her. Below is an post by Megan, a current student in Memory, Aging & Expressive Arts 2015. Megan reflects on what she has learned by working with her community partner. ~Anne Mondro, Professor of Memory, Aging & Expressive Arts. I am a student at the School of Social Work here at U of M, in the Geriatric Scholar and interpersonal practice program. I first became interested in working with people affected by memory loss when I was a junior in undergrad. I took a course in Aging and shortly after completed an internship in a Memory Care Unit at a local retirement community facility. I took this course, Memory, Aging & Expressive Arts, to learn more about infusing art while working with the older adult population and to also learn about Mild Cognitive Impairment, which was a completely new topic for me. At the beginning of the process when us students were meeting the Coffee House Members I was so taken aback by how willing they were to share about their memory loss. At one of our very first group sessions one of the Coffee House Members said “We are free to forget here”. It really showed me how close the group is and I felt very privileged being allowed to listen to their stories and to be let into their worlds. The Coffee House Club Member that I work with used to work as a home health aide with older adults, some of which had memory loss. Together her and I are complying a story of vignettes from her life experiences. Lately, my club partner and I have been reflecting on the idea that she has worked with older adults and that working with older adults is the career path I intend on entering. From this discussion, my Coffee House Club Member has been giving me work advice. I would like to share some of my Coffee House Club Member’s advice for working with older adults here: Be kind. Be pleasant. Treat them as if it is you in their situation. Keep a good attitude. Make a joke. Find out what they like. Don’t be afraid to talk to them. Think of ways to make it simpler for her. Go with the flow. Be ready to be their friend. I am an Art & Design student at the University of Michigan. I mainly like to draw and paint, so when I signed up for this class I couldn’t have expected to end up meeting a Coffee House member who would rekindle my love for music and make me realize the amazing healing power music can have. Throughout elementary, middle, and high school I had taken piano lessons, but since coming to college I’ve only touched a piano to show off with a few measures of the only piece I can still remember how to play. Before this class, I had lost touch with how fun and rewarding it is to sit down at a piano and learn a piece, or even to listen to classical music. During one session, we listened to playlists made specifically for the members. It really struck me when my community partner listened to his playlist and instantly entered what seemed to be such a happy state. We couldn’t think of the names of many of the pieces in the playlist, but my partner could hum them perfectly. The gaps between our generations seemed to close when we connected over our favorite composers. Music really seems to turn off any worries or frustrations, and throughout this class I think it has allowed us both to “zone out” and enjoy the creativity that goes into making beautiful music. I look forward to being able to share a musical performance together. Living in the moment: that is a value I believe working with Coffeehouse club members has helped me build. I show up at Silver Club, maybe a little late, maybe a little tired, but worries about school and friends seem to slip away when the members walk into the room with their smiles and enthusiastic energy. We gather together to share stories, laughter, and craft. I see the interaction as a healing therapy for both student and member as we work together and enjoy the morning. I have seen little more things in my lifetime that are more beautiful than the club members sharing their wisdom or expressing their sense of accomplishment after creating these many projects. My club member and I worked on making a kite. Hopefully it is going to fly, but if it doesn’t it’s just as valuable because of what we took from the process of working together to create it, both teaching and learning from one another to accomplish our goal.